Fallis’s newest book is Up and Down, a hilarious look at the world of PR, in which an American company and its cannier Canadian branch plant are hired to renew public interest in the space program. The hero of the plot, a PR man not unlike Fallis, decides a lottery should be held, with two winners gaining the right to join real astronauts on a space flight. Every thing goes according to plan until one of the winners is revealed to be more than NASA ever bargained for. Yes, Garneau was something of a consultant for Fallis on Up and Down, ensuring nothing was written about space travel that was just too impossible. And without being asked, Garneau also did a line-by-line edit of the book before publication, catching some typos and other minor errors. Fallis is very grateful for his help. The Toronto-based Fallis was interviewed recently over lunch in Ottawa and discussed his sense of humour, the world of PR, and the growing phenomenon of self-publishing. 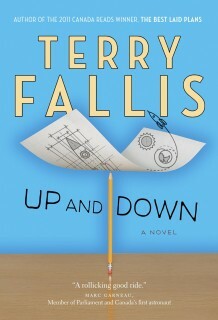 Up and Down is Terry Fallis's second book, out now. Are you normally a serious guy or are you always telling jokes? My friends and family will tell you my books read like dinner conversations at our house. They say they hear me in the books. They hear my voice so I think it’s a pretty close reflection of my sense of humour and how I tend to be. I grew up in a family where humour was a staple of everyday life. I have an identical twin brother (Tim). I think he said at one point that his share of the humour had dropped to 40 per cent of this book. Do you read humorous books? If I could only read funny novels, I probably would. That is my preferred fare: Robertson Davies, Mordecai Richler, Paul Quarrington, Donald Jack, Stephen Fry, John Irving, Christopher Buckley. John Irving – reading his novels – showed me the power of juxtaposing humour and pathos very close. He puts them right up against one another. 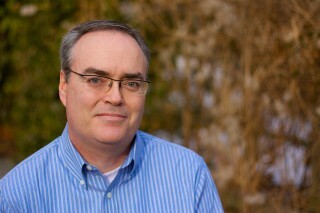 You are the poster boy for self-publishing. What advice do you have for people who want to self-publish? I’m a bit of a reluctant poster boy. Having done it both ways, having self-published and been published by McClelland & Stewart, I can certainly report that being published by McClelland & Stewart is much better. I had a great experience self-publishing but it was a decision born out of, I think, naivety and frustration as opposed to real thought. It is true none of what has happened to me would have happened had I not self-published. But I’m still so happy that I’m not self-publishing any more. Does the book treat public relations in a cynical way? I didn’t want it to be a cynical book. I’ve enjoyed my time in the agency world. I’m still in the agency world and I think there are great agencies doing good work. I hope the book is not perceived as blowing the lid off the public relations agency world. What do you like and dislike about public relations? What I’ve never liked and what I’ve always tried to avoid is the whole thing about spinning stuff. Tell the truth and tell it well. I’ve always believed that.